It doesn’t matter if your home is brand new or not, a self-guided ”audit” can provide added comfort and energy (money) savings! Opportunities to increase your homes’ energy efficiency are all around you. Use these helpful tips to create a checklist to follow to try to optimize your home for all seasons. Potential savings from reducing drafts may range from 5% to 30% per year and will make the home more comfortable year round. There are several places that you will want to visually check around your home — especially where two different building materials meet. Where the foundation and bottom of the brick or siding meet. Various vents and fans, etc. Check that the caulk seals are in good repair and your doors seal tightly. 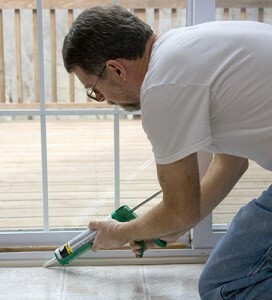 Inspect window frames for air leaks. An easy way to check if a window is sealed is to try gently rattling it. If it moves, then it isn’t sealed well. Another way to determine if there are leaks is to shine a flashlight through a seal like around a door and have another person outside tell you if they can see the light. If they can, then it’s not sealed well. Insulation is very important to your home comfort and efficiency. Though your home may have had the recommended amount of insulation when it was built, if your home is older, than it may no longer be adequate today. An easy spot to check is in your attic or at a crawlspace access point. Make sure the door or access panel has insulation on it. Checking the insulation in the walls generally requires a professional using a thermal-image camera. Other places to check insulation visually are possibly your water heater, hot water pipes, and furnace ducts. Watch out for ‘energy vampires!’ Energy vampires are devices that run constantly, even if you’re not using them, sucking dry your wallet! Consider using a timer on some devices, or unplugging an item when not using it. Check the settings on advanced electronics and appliances for energy-friendly settings. Follow the recommended guidelines for inspection of your HVAC equipment. Generally every year you should have your certified HVAC contractor perform a tune-up on your equipment. One thing that you can do yourself is check the air filter. Make sure it’s clean and doesn’t need replacement. Any ducts that travel through unheated spaces should be insulated.